'Contemporary Australia: Optimism' is the first in a triennial series of thematic contemporary Australian art exhibitions. 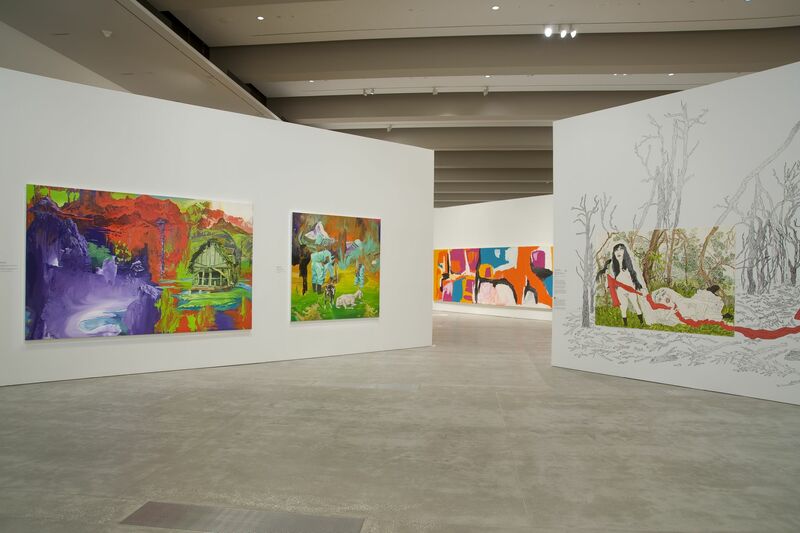 Encompassing many facets of contemporary Australian visual art and culture, the exhibition includes painting, sculpture, drawing, photography, installation, video and video installation, cinema, animation, performance, music and comedy. 'Optimism' celebrates the ways contemporary artists envision the world, exploring it with hope, energy, passion, playfulness and, above all, with the commitment to questioning and invention that comes out of the artist's studio. The exhibition presents work by more than 60 emerging, mid-career, and senior Indigenous and non-Indigenous contemporary artists from every state and territory, including Lisa Adams (QLD), Vernon Ah Kee (QLD), Tom Alberts (VIC), Tony Albert (QLD), Del Kathryn Barton (NSW), Chris Bennie (QLD), Daniel Boyd (NSW), Matthew Bradley (SA), Stephen Bush (VIC), Sean Cordeiro & Claire Healy (NSW/Berlin), Aleks Danko (VIC), Christian de Vietri (WA/New York), Rolf de Heer (SA), Gabrielle de Vietri (VIC), James Dodd (SA), Emily Floyd (VIC), Juan Ford (VIC), Julie Fragar (QLD), Dale Frank (NSW), Mirdidingkingathi Juwarnda Sally Gabori (QLD), Mark Galea (VIC), Tarryn Gill and Pilar Mata Dupont (WA), Kristin Headlam (VIC), Petrina Hicks (NSW), Timothy Horn, (VIC/New Mexico), Jamin (TAS), Natasha Johns-Messenger (VIC/New York), Christine Dew, Dave Jones & Students of Macleay Island State School, (QLD & VIC), Kayili Artists (Nola Campbell, Pulpurru Davies, Mary Gibson, Jackie Kurltjunyintja Giles, Ngipi Ward) (WA), Clara Law (VIC), Sam Leach (VIC), Michael Leunig (VIC), m3architecture (QLD), Robert MacPherson (QLD), Michael McWilliams (TAS), Tim Maguire (NSW/London), Thomas Meadowcroft (QLD/Berlin), Tom Moore (SA), Arlo Mountford (VIC), Kate Murphy (NSW), Jan Nelson (VIC), George Nona (QLD), Raquel Ormella (ACT), Robert Owen (VIC), Debra Phillips (NSW), Patricia Piccinini (VIC), Anna Platten (SA), Scott Redford (QLD), Victoria Reichelt (QLD), Tony Schwensen (NSW/Boston), Ritchey Sealy (NSW), Ivan Sen (NSW), Gemma Smith (QLD), Darren Sylvester (VIC), Regan Tamanui (VIC), Kathy Temin (VIC), Arlene TextaQueen (VIC), Jane Turner (VIC), Nawarupu Wunungmurra (NT), Michael Zavros (QLD).